BSE Sensex closed higher by 372.68 points, or 0.99%, to 38,090.64, while the Nifty 50 ended 145.30 points, or 1.28%, up at 11,515.20. BSE MidCap and SmallCap outperformed the benchmark and rose 1.62% and 1.38%, respectively.All the sectoral indices on BSE advanced with realty gaining most at 3.29%. Basic materials, power, metal, consumer durables, utilities and oil and gas rose over 2%. Vedanta, HPCL, Power Grid and NTPC were among the top gainers, whereas Coal India, Infosys, HCL Tech and GAIL were the top losers. Shri Keshav Cements and Infra Ltd shares traded 14.38% up at Rs 90.70 after the company said Karnataka government permitted the company to sell excess solar energy produced in open market. Ashok Leyland Ltd shares rose 3.97% to Rs 133 per share after the company said that it has won an order from Bangladesh Road Transport Corp. for the supply of 200 buses. Kwality shares traded 2.33% lower at Rs 20.95. The company reported a profit of Rs 1.04 crore in the June quarter, compared to Rs 27.88 crore a year ago. Revenue from operations stood at Rs 1,262 crore in the quarter, compared to Rs 1,572 crore in the same period last year. Tata Elxsi shares jumped as much as 1.96% to Rs 1,356.65 per share. The company announced that it has extended its partnership with Airtel Digital TV to deliver an engaging digital platform for customers. As part of the deal, Tata Elxsi will build the application software for the company’s innovative hybrid set-top-box, Internet TV. India needs to be extremely vigilant to check weakness in the rupee and the task was to minimise volatility and avoid contagion to other macro policies, Rathin Roy, a member of the prime minister’s economic advisory panel said on Friday. “The present challenge can be effectively dealt with,” said Roy, in a blog, ahead of Prime Minister Narendra Modi’s meeting on Saturday to consider steps to address weak rupee and rising fuel prices. WPI inflation eased to a four-month low of 4.53% in August on softening of prices of food articles, especially vegetables. The Wholesale Price Index-based (WPI) inflation stood at 5.09% in July and 3.24% in August 2017. Food articles registered deflation at 4.04% in August 2018, according to the government data released today. Deflation in vegetables was 20.18% in August. Deflationary trend in food articles offset the double-digit inflation in ‘fuel and power’ basket in August. Inflation in this category was 17.73 per cent as prices of domestic fuel increased during the month, in line with high global crude oil rates. 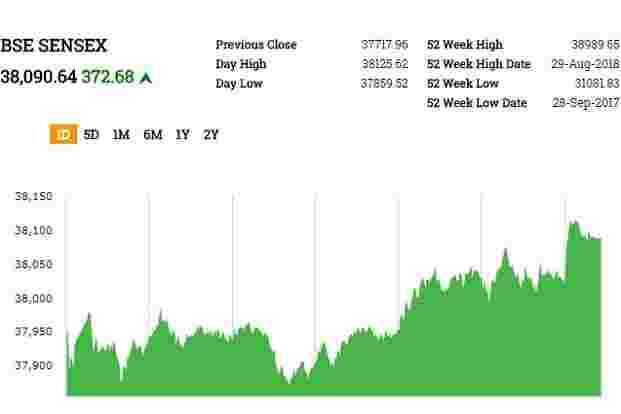 In the year so far, the BSE IT index has gained nearly 40%, outpacing gains in the benchmark Sensex index which has gained around 10%. Today, however, the Index was trading 0.38% down. KNR Constructions Ltd shares rose as much as 6% to Rs 213 per share after it said that unit KNR Shankarampet Projects Pvt. Ltd has received sanction from bank to finance its hybrid annuity mode project. NBCC India Ltd shares jumped as much as 5.45% to Rs 70.50 per share after the company on Thursday said that the Department of Investment and Public Asset Management has selected NBCC as the buyer for 100% of HSCC (India) Ltd for Rs 285 crore. Indian markets are looking expensive. Data sourced from Credit Suisse shows India’s price-to-earnings ratio premium to the world and the emerging markets is now at 29% and 69%, respectively. That’s the highest in seven years. Maruti Suzuki India Ltd rose 2% to Rs 8700 after the company said that it will boost productions of Baleno cars to cut down the waiting time for its customers. The automobile company has sold over 4.5 lakh units cumulatively since its launch. Rashtriya Chemicals and Fertilizers Ltd surged 11% to Rs 76 after the government gave ex-post facto approval for the transfer of land from Rashtriya Chemicals and Fertilizers Limited (RCF) to Mumbai Metropolitan Regional Development Authority. Shares of Sun Pharmaceuticals Industries Ltd rose as much as 3.24% to Rs 670.95 after the company said that it has received USFDA approval for Xelpros. The drug is used to treat ocular hypertension.